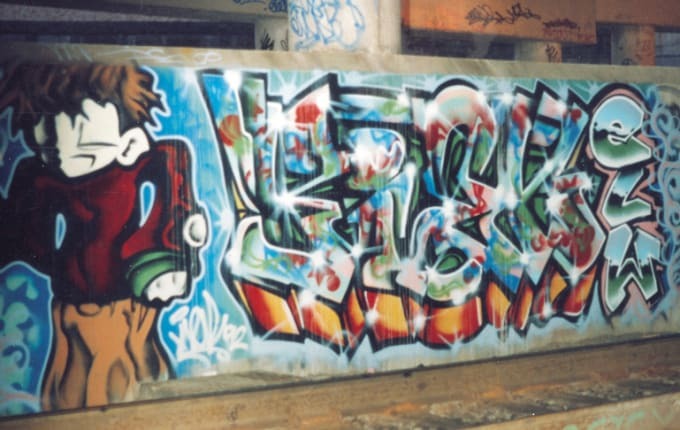 Of the many writers who were influenced by the early MCA crew, the work of KIER stands out for its apparent amalgamation of regional styles and his unorthodox letter structure. Beginning his writing career in 1990, he is one of the first writers from Maryland's Prince George's County to make an impact in the DC scene. He learned the ropes by watching MESK, JOKER and RUST. As he began painting more his style developed its own distinct look. As an avid student of style, KIER mixed graphic elements of other painting disciplines into his work. Heavily influential in P.G. County, where the 2DK L.A.B. picked up off of his lead in the late-90s, the full measure of KIER’s influence can now be seen, as newer generations of writers in DC utilize concepts KIER introduced in the late 1990s.